I-66 Relief Is on the Way? A deal announced in Virginia on Wednesday could have a big impact on your commute. Virginia Gov. Terry McAuliffe announced a compromise deal on Interstate 66 that will add an eastbound lane inside the Beltway. “We are now fixing the most congested road in the most congested region in the nation," McAuliffe said. Here’s the plan: by 2017, the HOV rush hour times will become consistent both inside and outside the Beltway -- eastbound from 5:30 to 9:30 a.m. and westbound from 3 to 7 p.m. Late next year, tolling will start inside the Beltway. But it will apply only to solo drivers, with no tolls for carpools. “If you are HOV today, you ride for free, you ride for free after," McAuliffe said. "All we’re offering here is an option to solo drivers who today are prohibited from going on 66 during rush hour." By 2020, drivers will have to have at least three people in the car to use the HOV lanes. Also that year, a third lane will open on I-66 eastbound, stretching from the Dulles Connector to Ballston. The proposed eastbound lane is the most controversial part of the transportation deal between the Democratic governor and Republican leaders. “This agreement is a big win for Virginia’s economy and for the commuters who spend too much time on the most congested road in the most congested region in the country,” McAuliffe said. The proposed new lane would only run from the Beltway to the Fairfax Drive/Glebe Road exit in Arlington. After that point, they don't have enough right-of-way to add a lane. However, Arlington lawmakers say they've been told that 40 percent of traffic exits at that point, alleviating concerns of creating a traffic bottleneck. "If we don't take this deal now, it's not going to happen for a generation," State Sen. Barbara Favola said. Planners reportedly will not have to take over any properties to add the lane. Back when McAuliffe and transportation officials proposed HOT lane tolling on the highway inside the Beltway, the plan was met with fierce opposition by GOP lawmakers, who said it was unfair to toll drivers and did not add road capacity. The new compromise is aimed at addressing that criticism by adding another lane. The deal between McAuliffe and Republicans concerns the entirety of I-66, both inside and outside the Beltway. While the part of the deal concerning I-66 inside the Beltway was the most controversial, the plan for outside the Beltway is essentially what McAuliffe and his transportation secretary had proposed before: two HOT lanes in each direction to Gainesville. The plan will also create more park-and-ride locations on I-66, similar to I-95 in that regard. It would also add more bus service. Officials in Fairfax County have applauded the compromise. 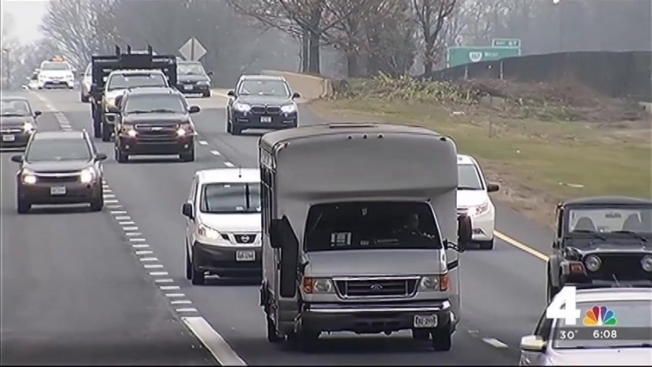 "This plan relieves congestion on I-66, maintains regional and local control over toll revenue, does not divert funding from other local and regional priorities," said Sharon Bulova, chairman of the Fairfax County Board of Supervisors. Work to widen I-66 east will begin this year, the governor said Wednesday. The Arlington County Board says they are disappointed with how soon the widening will take place. "We will do all we can to mitigate harm from the widening, and we will explore possible improvements to accompany the widening," said Arlington County Board Chair Libby Garvey. Stewart Schwartz of the Coalition for Smarter Growth called on lawmakers to carefully weigh the plan. “I think it’s incumbent upon the administration and Northern Virginia to invest as much in transit as fast as possible before the widening comes online," he said. Del. Bob Marshall (R-Prince William County) said he plans to battle the plan. “It may be a done deal, but I intend to fight it," he said. As the governor spoke, he and his wife held signs that read "Stop $17 tolls on I-66." “You’re going to bankrupt people. People making the minimum wage can’t even use this road. Period," he said. All of the revenue from the tolls will be used by the Northern Virginia Transportation Commission. The tolls are expected to make $18 million in 2018.